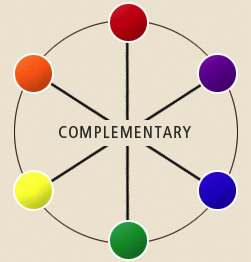 Complimentary colors always appear opposite each other on the color wheel. Use complements to create color balance in your 3D Architectural Rendering. It takes practice to understand how to use compliments, but a good rule of thumb is to use the complement - or form of the complement of the predominant color in your 3D Architectural Rendering to highlight, accent or gray that color. For example, if your 3D Architectural Rendering has a lot of green, use its complement, red - or a form of red such as orange or red-orange - for highlights. If you have a lot of blue in your 3D Architectural Rendering , use blue's complement, orange - or a form of orange such as yellow-orange or red-orange. The complement of yellow is purple or a form of purple. Keep a color wheel handy until you have memorized the color complements.